The Kitchens at Reynolds will open its doors at 2500 Nine Mile Road during the 2019-2020 academic year. But the new building will be home to more than just a culinary school. For East End residents it will also serve as the front door to an amazing menu of workforce training and academic opportunities. Follow The Kitchens Timer for the latest countdown news, facility sneak peeks, enrollment information, interviews, and events. (twice the average growth rate) from 2016 to 2026. Executive Chef. Pastry Chef. Sous Chef. Line Cooks. Or: Food Batch Maker. Food Science Technologist. Food Technician. Kitchen Operations Manager. Cookbook Author. Cookbook Editor. Food Manufacturing. Food Festival Organizer. Taste Tester. Food Photographer. Culinary Device Tester. Food Truck Event Organizer. American’s Test Kitchen. Curator of Culinary Libraries. Food Forager. Research Chef. Food Journalist. Food Monger. Packaged Food Producer. Aguaponics Production Manager. Food Science Documenter. Food Truck Designer. Restaurant Publicist. And the list goes on. Ryan graduated from Reynolds in 2011 and soon after had his first “non-chef” job as a Cheese Monger, aka Cheese Purveyor. He had to learn everything about cheese to sell it globally. But, perhaps more important, he had to learn everything about buying cycles, government import and export regulations, and distribution methods. Soon after he came back to Richmond he became Kitchen Operations Manager for Hatch Richmond RVA, where he ventured down another road of food education and ultimately another food industry career. When he graduated from Reynolds, Denton sent three resumes to Momofuku, and never got a response. But, he knew what he wanted, and “no” was not an option. So he got in his car, drove to DC, walked in to Momofuku, and said: “I want to work here.” The Chef that day told him simply, “Show up tomorrow.” Denton did show up. Aced his interview, and is now living his dream. With Momofuku he now has opportunities to travel the world, learn about food and food practices, and continue his education. What will the educational experience be like at The Kitchens at Reynolds? One look at the modern building says it all. 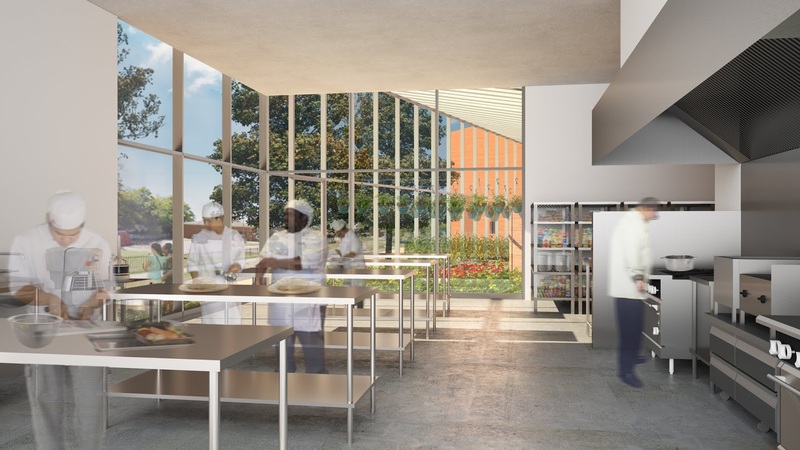 In addition to state of the art, fully equipped kitchens, The Kitchens at Reynolds will have a full service Café, onsite greenhouses, and a demo kitchen. Plans call for students to prepare three-course, donation-based community dinners. An Internship portal will be used to link students with food businesses or industries. Once they graduate, students transition to the status of “job seeker” and Reynolds continues to play a role in their career. They can use the database throughout their career to track their work and accomplishments. To learn more about the culinary educational experience at Reynolds, read these profiles of four Reynolds graduates. From Left to Right: Denton Taylor / Momofuku, Willoughby Harrington / The Inn at Little Washington, Dave Hirshman / Billy's of Roanoke, Ryan Evans / Hatch Kitchen RVA. *Bureau of Labor Statistics, U.S. Department of Labor, Occupational Outlook Handbook, Food and Beverage Serving and Related Workers, on the Internet at https://www.bls.gov/ooh/food-preparation-and-serving/food-and-beverage-serving-and-related-workers.htm (visited February 25, 2019).